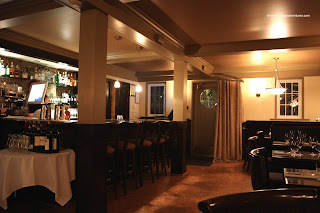 It's a shame that I never had a chance to try Parkside before it was relaunched as L'altro Buca. It was only my list of places to visit. Well, with the current economic climate, it was probably for the better that the change was made. Much like Fuel being re-branded as Refuel, moderately priced fine-dining is in. It's places like Les Faux Bourgeois, Salade de Fruits, Pied-a-Terre and DB Bistro that thrive when more expensive places falter. Tonight, Viv and I joined by Costanza and Elaine, ventured into the West End to see how L'altro Buca stacks up to the rest. Of course, when dining in the Downtown core, parking is always an issue unless you do valet. We were extra concerned about tonight since the West End is known for it's limited amount of parking. Imagine our surprise when we not only found parking, we parked right across the street from L'altro Buca. Apparently, there are around 6 free spaces across the street on Haro. Too bad for Costanza, he parked in the first metered spot he found on Denman. I made sure to razz him about that! We were dining particularly early tonight since I knew it would be less busy. The reason? So my flash would not bother the rest of the diners. As it turns out, we were the only ones there for most of our meal. 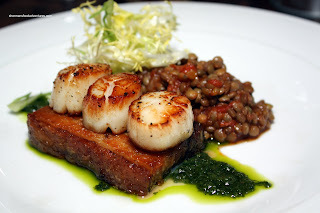 For my starter, I selected one of their daily features which happen to be 2 things I love: Pork Belly & Scallops. Beautifully presented, 3 perfectly seared Hokkaido scallops rested atop a crispy piece of pork belly. Salsa verde, lentils and frisee rounded out the dish. The salsa verde did its job providing aromatics and flavour. Believe this or not, I would've preferred a more fatty piece of pork belly. Don't get me wrong, it was delicious; but it was quite meaty. The whole beauty of pork belly is the fat! The lentils were cooked perfectly maintaining a slightly chewy texture and there was a nice tomato element that provided subtle flavour. As Viv predicted, Elaine went for the Gamberi, which is lemon, chili and garlic prawns. If this keeps up (at Bishop's), we can just order each others' dishes since it seems like we can guess correctly almost every time! To me, this was probably the most successful appetizer we sampled. 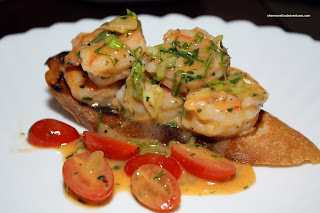 5 large prawns draped with a sauce consisting of butter, garlic, chili, lemon, plum tomatoes and scallions rested atop a very crunchy slice of grilled baguette. The prawns were perfectly cooked with a fresh "snap" texture. I felt that the sauce was predominantly garlic with chili and lemon in the background. Surprisingly, after all the prawns were all consumed, the crunchy bread held up to the sauce. Viv and Costanza both had the Scallop Carpaccio with duck prosciutto with citrus and radish, arugula, frisee and fennel salad with truffle vinaigrette. 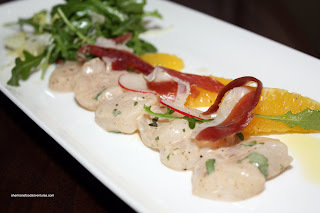 Although the scallops were fresh and sweet, the star of the dish was the house-made duck prosciutto. It provided the necessary savoriness to the dish without being overly salty. Curiously, the salad was deconstructed with the orange segments acting more as a garnish. Although we could taste the citrus in the vinaigrette, it hid any evidence of truffle. 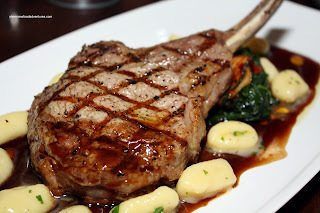 For my main, I also went for the daily feature - the Veal Chop with sage and marsala reduction. Surrounded by extremely soft gnocchi, the large chop was quite tender. Completing the plate was spinach and zucchini which were laced with tomato, garlic and some spiciness. Predictably, the reduction was a tad bitter and tart. Being neither salty or sweet, it needed an extra dimension to flavour the meaty chop. 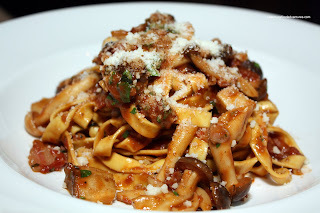 Costanza ordered the Tagliatelle Boscaiola which consisted of mushrooms, bacon, tomato, cream, brandy. I felt that the sauce was a tad on the salty side probably due to the bacon. However, it was quite light despite the inclusion of cream and brandy. The juicy mushrooms provided a nice woody aroma to the dish. Although the noodles were al dente and pretty much executed perfectly, I thought it was a bit doughy. Costanza didn't think so; thus it could just be me. 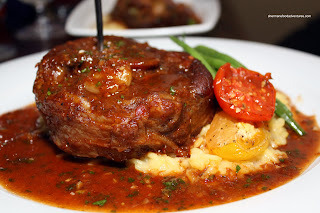 For her meal, Elaine chose the Osso Buco. It consisted of a good portion of veal shank cooked in a tomato red wine sauce (with gremolata) resting on saffron risotto. Ever-so-tender, the red wine sauce penetrated the meat subtlety. Although the risotto held up well to the abundance of sauce on the place, it was not risotto-like at all; rather, it was too much like plain cooked "rice". I left Viv's meal to the end since something interesting happened. 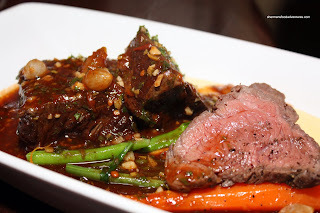 Her dish, the Manzo which is a duo of grilled beef tenderloin and braised short rib was actually quite ordinary compared to the rest of the mains. The short rib was a bit stringy and not all that moist. However, the tenderloin was pretty good, it was quite "meaty". Despite appearing to be overly sauced (garlic & chili), most of it was soaked up by the items on the plate including the polenta. It was creamy, garlicky and plasticky. Plasticky??? Yes, there was a nice piece of plastic wrap awaiting inside as a surprise. We decided not to say anything about it since to us, it really wasn't a big deal. Hey, we're Chinese. We've had worse things in our food before. However, that's not what our server thought. He noticed it and had this expression of concern and horror on his face. He profusely apologized on the kitchen and restaurants' behalf. Honestly, we weren't that upset (I'm sure other people would be and with good reason). 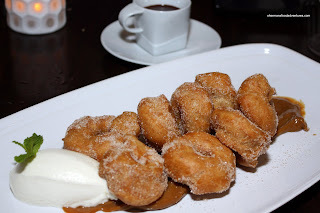 But they felt so bad, they took Viv's meal off the bill and brought us all a really big plate of soft, warm Zeppoles for us to share. 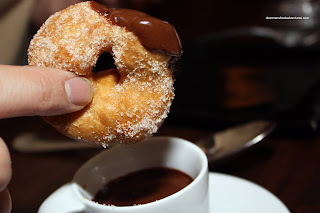 Plated on top of a bed of dulce de leche, the decadence quotient was elevated by the chocolate dip served on the side. Similar to the 1528 found at Dulcinea, this was smooth, silky, chocolaty and only semi-sweet. This was a very nice way to end an enjoyable meal. Pretty much everything was good and the service was excellent. They were able to turn a potentially bad situation into a positive which is a testament to their professionalism. - Dining space feels a bit "old"
My only visit to Parkside was for a very dear friend's birthday (my treat, of course). Among the best $200 I have ever spent on a meal. those scallops look incredible. i find a lot of restaurants either overcook or undercook their scallops. getting one properly cooked is always exciting - they just don't taste right otherwise. The fact that they apologized and comped you for their mistake ranks them above the others in my books for being attentive and caring to their customer as most restaurants these days, including high end ones, could care less. I almost want to visit this restaurant just for that fact alone. Now if they only had lunch specials. Yes, I'm very sad that I never made it to Parkside... :( No, La Buca is down the road sometime! Yes, the scallops and pork belly was a very good appetizer. Looks good in the picture too! Yum! Holly, you are absolutely right. Sure they made a mistake, but they made up for it in spades. Bravo to them and I will be returning. Your osso buco looks 10x better than what I had in Milan But then the tour guide took us to a less fanciful restaurant and we were in jeans and Nike. Yes, the Osso Buco was indeed good. Better than Milan? I guess as you said, different type of restaurant.